I have some exciting news. 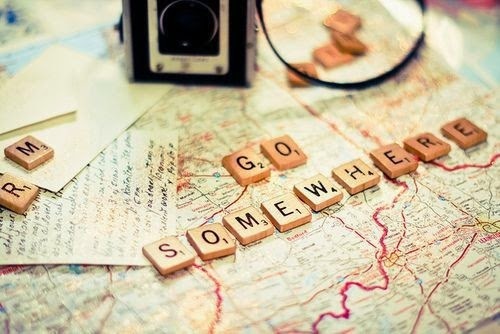 My travel plans for the spring are quickly growing and I’ve finally booked a few flights! 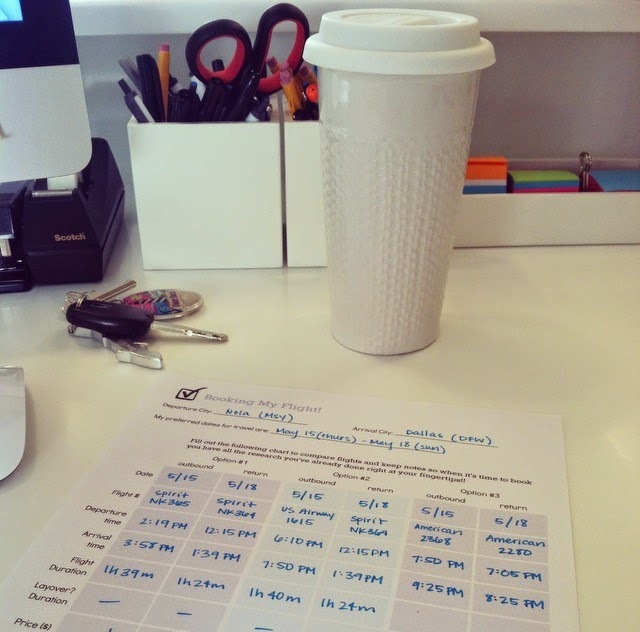 The best part is I created this nifty worksheet to simplify the whole process and get all the important details in one place. But I’m getting ahead of myself. For me booking a flight is frustrating because I can’t check it off my list right away. It’s one of those things that you get back what you put into it. I have found the best travel deals when I’ve put in the time, done some research and thoroughly looked around the web. In the past the very first thing I do after deciding on a trip is open up the skyscanner app and plug in a few flight options to get an idea of the prices. Then the waiting game begins. I check back every once in awhile to see if the prices changed. I look at specific airlines to see how many points I can earn from them. I also check the prices for one way tickets and see if I can mix and match any one-ways to make a more convenient itinerary or get a cheaper price. When it finally comes time to book (normally this means my friends are getting organized and we’re ready to make the commitment) I end up redo-ing all this research because I sure didn’t write down any flight numbers. And any dates and times I wrote down are long since gone to the depths of my school bag. So I rely on my habits and retrace my steps on each search engine until I find a few options that look familiar or convenient. So about those flights I booked… I’m going to Dallas May 15-18 for a weekend of debauchery with my college soulmates and May 29 I’m off to Thailand! When traveling with friends, I find it particularly important to juggle a variety of factors. We all want to arrive and depart around the same time, and hopefully on the same days. 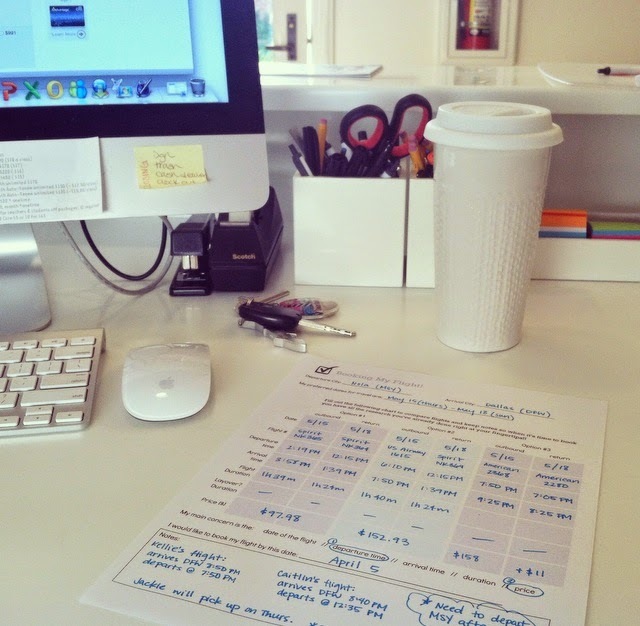 I also have to factor in my personal schedule and budget. I decided to call upon my inner teacher and create this little worksheet (have I mentioned I was once nicknamed the queen of spreadsheets? I chose to take it as a compliment…). 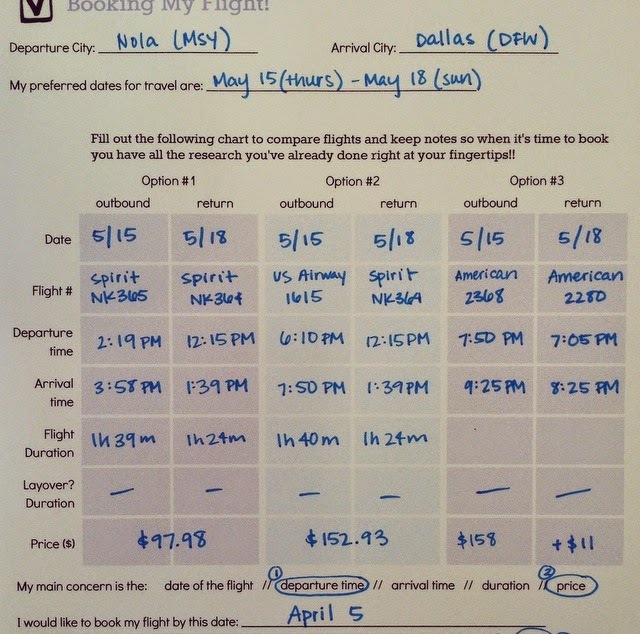 You can see how I used the worksheet to book a flight for Dallas that coordinated with my friends’ flights. This worksheet allows you to compare up to 3 flights. When I did my research I wrote down the 3 flights I would most likely book based on their convenience and price. When it came time to book I had all the flight information right in front of me and was able to purchase the ticket quickly. You can download the worksheet from my Google Drive here or from the resource box below. 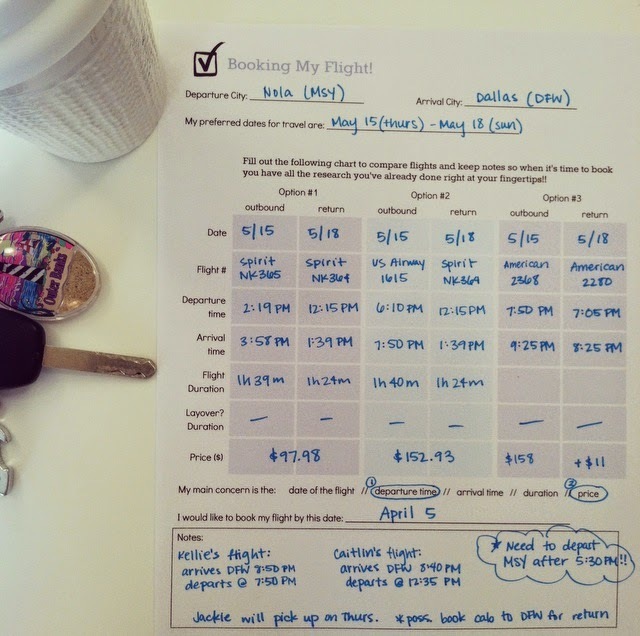 Let me know what you think because I’m going to start sharing some more of the organizational tools I use and create for myself to plan travel.